Norwegian Cruise Line today announced that the latest vessel in the company’s ship revitalization program, Pride of America, will enter dry dock in March 2013 for major enhancements, including the addition of new luxurious suites and studio staterooms. Pride of America enters a 14-day dry dock on March 23, 2013 in Honolulu, Hawaii. 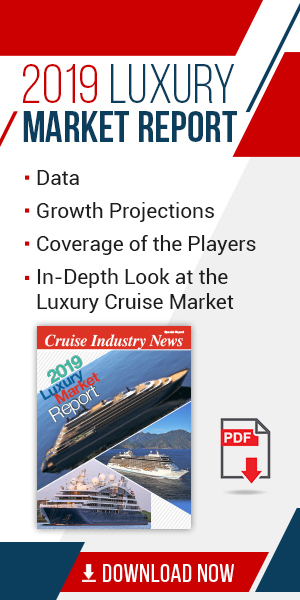 The 2,124-passenger ship will receive major renovations including the addition of 24 ultra-luxurious suites, four Studio staterooms and four inside staterooms; Moderno Churrascaria, the line’s signature Brazilian-style steakhouse; ship wide wireless internet connectivity; new carpeting throughout; flat screen televisions in all staterooms; updated décor; upgrades to the fitness center; new directional signage; renovations to the gift shop, photo gallery and art gallery; and much more. The 24 new suites on Deck 13 will be outfitted with premium custom furnishings, fabrics, carpets and ultra-luxurious bathrooms. Two of the 24 suites will be Deluxe Owners Suites. These 566 square foot suites, sleeping up to four guests, will feature a large bedroom, separate living area and a state of the art bathroom featuring custom mosaic tiles. The remaining suites will be Family Suites ranging from 363 to 416 square feet, most sleeping up to six guests. The two Deluxe Owners Suites will have connecting doors to the adjacent Family Suites, sleeping up to 10 guests when combined, the perfect option for families or groups who wish to travel in luxury together. Two of the Family Balcony Suites will be ADA compliant to accommodate guests with disabilities. One of the many highlights of the suites will be their expansive balconies, ranging from 245 square feet for Family Suites to 410 square feet for the Deluxe Owners Suites, giving Pride of America’s suite guests the largest balconies in the fleet, perfect for taking in the jaw-dropping Hawai`i scenery. In addition to all of the features in the suites, guests will enjoy pampering service from dedicated butlers and concierge, plus an array of exclusive amenities such as luxurious Tranquility mattresses from the Bliss Collection by Norwegian, Lavazza Espresso Makers, Elemis bath products, private dining for breakfast and lunch, and more. Guests wishing to travel solo in Hawaii can now do so in one of four new Studio staterooms on board Pride of America. Designed and priced for the solo traveler, these staterooms will feature a full-size bed, along with a separate bathroom area. Four new inside staterooms will also be added to the area on Deck 13. 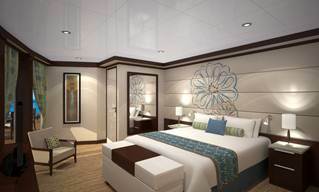 All of the new suites and staterooms will go on sale October 1, 2012 for sailings beginning September 7, 2013. Additional refurbishments include: Upgraded flat screen televisions in all guest and crew staterooms broadcast on a digital signal; wireless internet access throughout the entire ship, including crew areas; replacement of carpet throughout the ship in guest staterooms and public areas; Video, sound and light enhancements throughout the ship; upgrades to fitness center equipment; décor updates in the Aloha Cafe, the ship’s buffet restaurant; Lazy J’s Steakhouse converted to Norwegian’s signature steakhouse, Cagney’s; updated signage throughout the ship; renovations to the Photo and Art Gallery. Pride of America will return to her seven-day Hawaii itinerary departing from Honolulu every Saturday when she returns to service in early April 2013. Ports of call include an overnight in Kahului, Maui; Hilo, Hawaii; Kona, Hawaii; an overnight in Nãwiliwili, Kauai; and an afternoon cruise past the breathtaking Nãpali Coast.